Over the past few months I have become very interested in yoga and how it can help children become disciplined and centered. 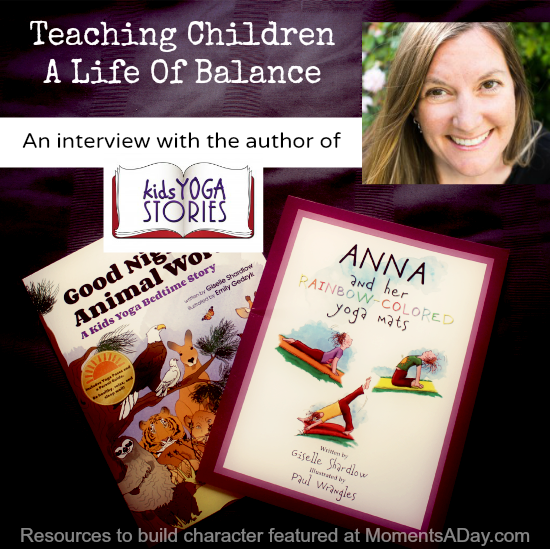 After thoroughly enjoying the resources from Kids Yoga Stories, I am excited to introduce author Giselle Shardlow and her lovely books to you. Chelsea: Thanks so much for taking the time to share your story with Moments A Day readers. Can you start off by telling us a bit about yoga philosophy? Giselle: Yoga was created thousands of years ago in India, and the Sanskrit word literally translates as “union.” Yoga is meant to guide its practitioners to balance their mind, body, and spirit. This ancient wisdom is more than just yoga studios or weird and wonderful postures we only dream of doing. It’s a way of life encouraging us to be productive, responsible, and compassionate human beings. Yoga is an integration of mindfulness, meditation, breathing techniques, character education, positive affirmations, and physical postures. Definitely check out The Yoga Sutras of Patanjali translated by Alistair Shearer to dig deeper into the guiding principles of yoga. Parents and teachers can introduce children to the benefits of yoga in a variety of ways, including doing yoga poses while reading stories, bringing awareness to their breath to help reduce stress, using books with positive messages as a springboard to discussing social issues, engaging in volunteer service projects, or creating practices of daily gratitude. Chelsea: Thanks for explaining that, I look forward to learning more, it’s all very interesting! One thing that immediately drew me to your books is how they encourage movement in kids as this really engages active learners with the stories. What age do you find kids start to get interested in following along with the poses in the books? 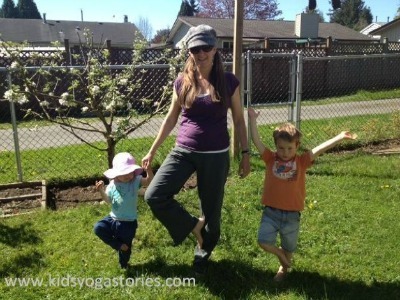 Giselle: I started reading the yoga stories to my daughter just after she was a year old. She pointed to the yoga kids demonstrating the yoga poses and understood that the stories involved movement. She didn’t have the words to express herself, but she used her body to say “kangaroo” or “monkey.” We have just started publishing yoga stories for toddlers and preschoolers, but our first yoga stories were aimed at four to seven year olds. But I think kids usually start to get interested when the grown-ups do. Little ones under a year might be more interested in the pictures than the poses, but toddlers like to mimic parents and teachers. So getting up and trying the poses yourself is great. That will get them into it earlier. Chelsea: I love the story of Anna and her Rainbow-Colored Yoga Mats and how yoga gave her a chance to interact positively with those around her. Can you share what you hope children will learn from reading this story? Giselle: In yoga teacher training, I learned about one of the moral principles of Santosha, translated from Sanskrit as “contentment.” It says that true happiness comes from being content, non-attached, and from being accepting of our lives. Anna understood that happiness comes from within, and I hope to share this idea that we can’t always depend on external factors to make us happy. As a new student who is hard of hearing, Anna feels out of place, but she finds happiness on her yoga mat at recess time. She lives by her mom’s wise words: “Be true to yourself, Anna. If you want to be happy, then you must be happy for others around you.” Her mom’s motto is based on Yoga Sutra 1.33 from The Yoga Sutras of Patajanli. Anna’s happiness attracts positive interactions from the students at her school, and she gets to share the joy of yoga. My intention was for parents and teachers to be able to use the book as a tool to talk about acceptance, friendship, and happiness. Chelsea: Our family loves the multicultural aspects that your books include as well. Can you tell us a bit about how you chose the various themes for your books? Giselle: When writing, I like to integrate my experiences with teaching, traveling, and yoga. As an international teacher, I saw first-hand the benefits of teaching children about the environment, world cultures, and healthy lifestyles. I believe that global awareness fosters empathy and compassion for others around the world and for the planet itself. I also noticed that children learn best by pairing movement with reading meaningful stories, so that’s how the themes all came together. Each of the Kids Yoga Stories features one or more of the yoga kids, who are from six different continents. 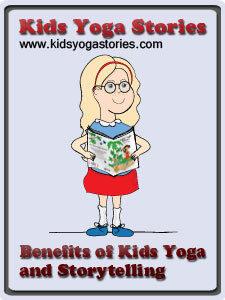 Throughout the story the yoga kid leads readers through the poses, which are presented in a specific yoga flow. The children bring the story to life through movement. I love to put the yoga kids in lovely places I’ve visited, and sometimes, I look to real children for inspiration. Some of the stories are inspired by the adventures, and concerns, of real kids. Chelsea: What response have you had from children and parents about your books? Giselle: It’s been phenomenal! Readers say that the Kids Yoga Stories books are playful, engaging, and adventuresome. 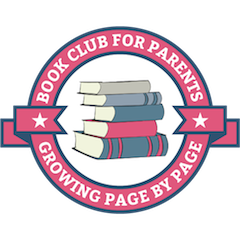 Children love acting out the books, and parents love that their children are learning healthy activities and having fun while reading. The parent-teacher guides at the back of the books are well received as a resource guide for teaching yoga to children. Teachers have been asking for matching yoga cards and posters, both of which we are creating to supplement the books. Parents and teachers also love that the books teach about the environment and world cultures in a fun and accessible way. They say that the books encourage children to be creative, use their imaginations, and play cooperatively together. 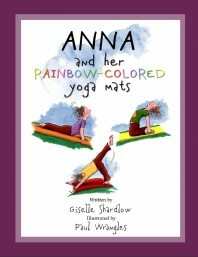 Last year, Sophia’s Jungle Adventure and Anna and her Rainbow-Colored Yoga Mats were voted the top two books for kids yoga, which is a true honor. Chelsea: Thank you so much for sharing with us today. I love learning about your journey and look forward to following along via your blog. Giselle: Thank you for your thoughtful questions! I hope you and your readers enjoy the yoga stories as much as I do creating them. 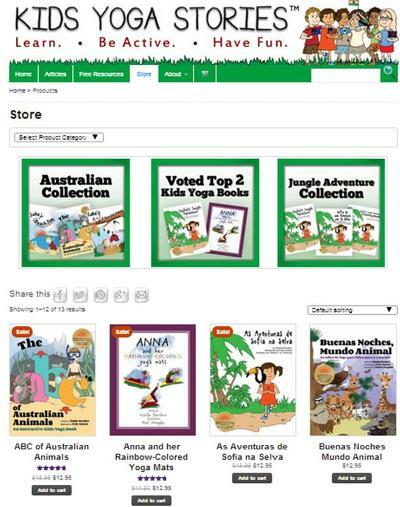 Find out more: Visit the Kids Yoga Stories website and check out the store. You can also connect with Giselle on Facebook, Twitter, and Pinterest. This post was sponsored by Kids Yoga Stories. For more information about sponsorship on my website please visit this page.